The Academy is a five-day summer school organized by Sawty Sousse in partnership with Legacy International, Club Café Culturel at Complexe des Jeunes Sahloul and under the supervision of State Department. 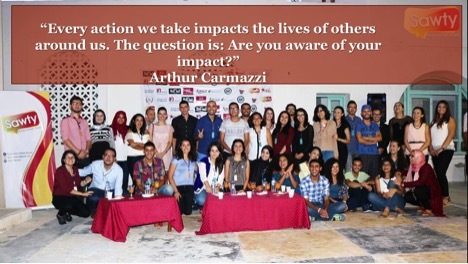 This project gathered young Tunisians from the rural areas of the governorate of Sousse to take part in an all-inclusive training on the fundamental principles of democracy and participation in decision making. Through this academy, the participants had acquired new skills that would help them become future leaders and decision-makers in their local communities. Furthermore, it was an opportunity for them to get involved in civic and political life and become active. The project encompassed workshops on the functioning of civil society, project management, budgeting, local governance, advocacy, accountability and internet governance, dialogue and debate sessions in addition to a panel discussion on the Participation of Youth in Public Life and Decision Making. The panels featured several renowned panelist; the then-secretary of state of youth affairs, regional delegate of youth affairs, local governor and two representatives from civil society on women empowerment and elections/decentralization fields and was attended by guests from the US Embassy Tunis and local government officials. The beneficiaries of the project are now applying what they had learned during The Academy through the implementation of follow-up activities and projects and participation in events organized by other NGOs. Indeed, their high commitment and enthusiasm testify to the success of such a project as it left a positive impact on them and made a transformative change.